Qualcomm's much-anticipated ARM-based Centriq 2400 product line, which started shipping commercially this week, is a worthy contender to break Intel's virtual monopoly in the server processor arena, where data center operators are thirsting to see competition to help bring down costs. An unsolicited acquisition bid for Qualcomm from Broadcom, emerging server-chip competitors and legal wrangles involving Apple and other vendors, however, cast a bit of a shadow on prospects for the new chip. Qualcomm revealed some impressive specs at an industry event in San Diego Wednesday, bringing out a a variety of big-time cloud, hardware and software providers to show support. The Qualcomm Centriq 2400 wafer processor. ARM-based chips, which up to now have dominated smartphones and tablets, have the potential to be power-efficient alternatives to Intel's x86-based systems. Qualcomm says that with a list price of $1,995, the 48-core Centriq 2460 offers four-times better performance per dollar and up to 45 percent better performance per watt than Intel's high-end Skylake processors, released earlier this year. Though these figures are based on Qualcomm-directed tests, they bode well. "It should be competitive -- there is a lot of interest in ARM server processors because no two workloads are the same," said Jim McGregor, principal analyst at Tirias Research. The high core count and focused throughput of the Centriq line has benefits especially for cloud workloads, web servers, and enterprise data centers doing different instantiations for their corporate users, McGregor noted. "The is gonna bring big changes to the way data centers are rolled out and one of the things I love is we brought this power efficiency from the mobile space into the data center space and that’s something that the world needs," said Paul Jacobs, the executive chairman of Qualcomm, at the launch event. 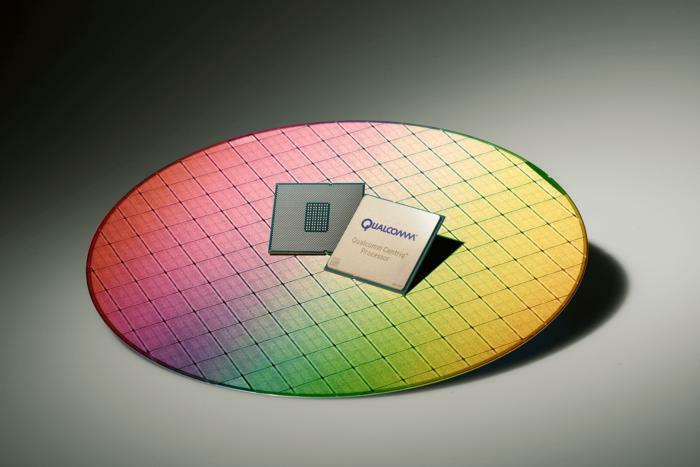 Qualcomm's Centriq ARM-based architecture includes custom Falkor cores. Software built to run on Intel X86 chips have to be rewritten to run on the ARM instruction set, but a shift in the way applications are developed and data centers are built has already started to take place, helping to clear a path for new competitors, Jacobs noted. Taking advantage of cloud services, Jabob said, users can procure virtual machines and get online in minutes, and this is changing the way apps are being developed. "In the traditional IT environment apps and services are delivered through scaling up with bigger servers but in the cloud environment they are delivered through scaling out -- so, more and more servers, and the projections now are that 50 percent of servers are going to be deployed in cloud environments by 2020," Jabos said. "So what that means is that has really changed the design point for the server -- it creates this tremendous opportunity for Qualcomm." It's not just mobile apps that are being developed for ARM architecture, but AI, IoT and data center software as well, Jacobs said. The Centriq 2400 line is based on the ARMv8 64-bit architecture and Qualcomm has contracted with Samsung to use its 10-nanometer silicon fab process to manufacture the chips. On its part, Intel which will not be shipping chips manufactured with the 10nm process until later this year or early 2018. Qualcomm is boasting that the Centriq is the world's first 10nm server chip. Generally, the smaller the manufacturing process technology, the greater the transistor density on processors, leading to cost- and performance efficiency. The incredible demand for smartphones over the last few years has led manufacturers to invest in technology to build mobile chips with the 10nm process, said Anand Chandrasekher, speaking at the San Diego event. "Volume economics are required to effectively drive the learning curves down and the smartphone volume economics are effectively outweighing the PC volume economics by a substantial amount," Chandrasekher said. What are the Centriq's specifications? Samsung’s 10nm FinFET process puts 18 billion transistors on only 398mm2. The Centriq 2400 family contains up to 48 high-performance, 64-bit, single-thread cores, running at up to 2.6 GHz frequency. The cores are connected with a bi-directional segmented ring bus with 250GBps of aggregate bandwidth to avoid performance bottlenecks under full load, Qualcomm says. 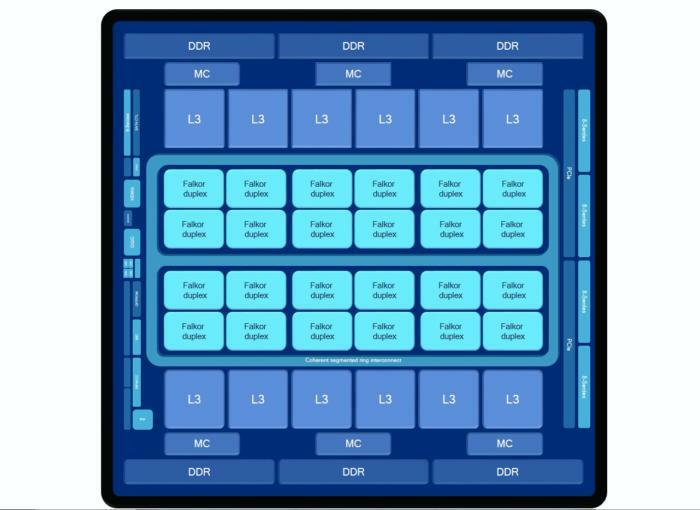 To maximize performance under various uses, the design has 512KB of shared L2 cache for every two cores, and 60MB of unified L3 cache distributed on the die. In addition, it has 6 channels of DDR4 memory and can support up to 768 GB of total DRAM capacity with 32 PCIe Gen3 lanes and 6 PCIe controllers. The Qualcomm Centriq 2400 processor family also supports supports hypervisors for virtualization. The Centriq 2400 family initially includes, the 40-core/2.5GHz Centriq 2434 priced at $888, the 46-core/2.6GHz Centriq 2452, priced at $1,383 and the 48-core/2.6GHz Centriq 2460, priced at $1,995. The Centriq chips may not be able to meet Intel head-on in every workload. For example, workloads with huge data sets may not be the Centriq's strength, considering that while it has 32 lanes of PCIe connectivity, Intel's scalable line offers 48 lanes and AMD's Epyc line offers up to 128 lanes. To help make up for that, Qualcomm is likely to be much more flexible than Intel about customizing its chips for specific customers, since ARM modular architecture allows for easier customization than x86 architecture. Matthew Prince, co-founder and chief executive officer, Cloudflare, took to the stage in San Diego to say the chips hold out the promise of bringing data center costs down. "While testing Qualcomm Centriq 2400, we found it to be twice as power efficient as the Intel Skylake 4116 processors," he said. Tech industry havyweights voicing support for the chip line included Microsoft, Alibaba, HPE. Qualcomm, however, faces a number of rivals who are starting to emerge as competitors to Intel in the server market, as well as potentially costly distractions -- chief among them, for the moment, being Broadcom's unsolicited $130 billion bid, announced earlier this week. Broadcom had quietly shut down its business unit developing ARM server technology, raising the question of what it would do to the Centriq product line if its bid for Qualcomm succeeds. Meanwhile, while the debut of the new 10nm-process ARM server chips has been long awaited -- Qualcomm has been developing the chip for the better part of five years and dropping hints about it for two years -- the competitive landscape has changed recently. Who are the other ARM chip server contenders? Earlier this year, Microsoft embraced Cavium, another maker of ARM server chips, as a participant in its Project Olympus open-architecture server initiative, even as it voiced support for Qualcomm. Other ARM server contenders include The X-Gene 3 server platform developed by AppliedMicro -- that technology has found a new home in the Carlyle Group after Macom acquired AppliedMicro earlier this year. AMD's Epyc chip, released in June, is also a powerful contender for the data center, and has the advantage of running on the X86 platform, Tirias Research's McGregor said. “Everyone was waiting for Qualcomm to come out with their server chip, and then all of a sudden we got a surprise earlier this year with AMD," McGregor said. "It was like, whoa, they’re actually competitive again." In addition, Qualcomm's patent dispute with Apple has broadened to include cases not only in the U.S. and Europe, but Asia as well, leading Apple to direct some of its manufacturing partners to withhold payments to Qualcomm -- another ongoing distraction. In any case, the server market moves slowly. Server-processor testing can take the better part of a year. So no matter how Qualcomm's legal issues turn out, it's likely to take 12-18 months before any of the new server-chip contenders make a significant dent on Intel's server stronghold.